१९४७-१९४८ के युध्द दौरान भारतीय सैनिक. Pakistan controls roughly a third of Kashmir (Azad Kashmir and Gilgit–Baltistan), whereas India controls the rest (Kashmir valley, Jammu and Ladakh). ↑ Jamal, Shadow War 2009, पृ॰ 49. ↑ अ आ इ Jamal, Shadow War 2009, पृ॰ 57. ↑ Simon Ross Valentine (27 October 2008). Islam and the Ahmadiyya Jama'at: History, Belief, Practice. Hurst Publishers. पृ॰ 204. आई॰ऍस॰बी॰ऍन॰ 978-1850659167. ↑ अ आ "Furqan Force". Persecution.org. अभिगमन तिथि 14 March 2012. ↑ Bhattacharya, What Price Freedom 2013, पृ॰ 30. ↑ अ आ Nawaz, The First Kashmir War Revisited 2008, पृ॰ 120. ↑ अ आ Malik, V. P. (2010). Kargil from Surprise to Victory (paperback संस्करण). HarperCollins Publishers India. पृ॰ 343. आई॰ऍस॰बी॰ऍन॰ 9789350293133. ↑ "The News International: Latest News Breaking, Pakistan News". अभिगमन तिथि 3 April 2016. ↑ "What Went Into Making Jammu And Kashmir Part Of India". ↑ "Resolution adopted by the संयुक्त राष्ट्र Commission for India and Pakistan on 13 August 1948" [संयुक्त राष्ट्र महासभा भारत और पाकिस्तान के द्वारा पारित प्रस्ताव]. mtholyoke.edu. 1948-11-09. अभिगमन तिथि 2015-09-03. ↑ "Indo-Pakistani Conflict of 1947-48". ग्लोबल सेक्युरिटी. २०११-०७-११. अभिगमन तिथि २०१५-०९-०३. Operations In Jammu and Kashmir 1947-1948, Ministry of Defence, भारत सरकार, Thomson Press (India) Limited. नई दिल्ली 1987. This is the Indian Official History. Slender Was The Thread: The Kashmir confrontation 1947-1948, by Maj Gen LP Sen, 1969. Orient Longmans Ltd नई दिल्ली. Without Baggage: A personal account of the Jammu and Kashmir Operations 1947-1949 Lt Gen. E. A. Vas. 1987. Natraj Publishers Dehradun. ISBN 81-85019-09-6. Kashmir: A Disputed Legacy, 1846-1990 by Alastair Lamb, 1991. Roxford Books. ISBN 0-907129-06-4. The Indian Armour: History Of The Indian Armoured Corps 1941-1971, by Maj Gen Gurcharn Sandu, 1987, Vision Books Private Limited, नई दिल्ली, ISBN 81-7094-004-4. 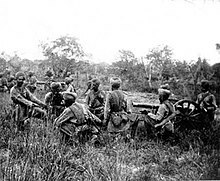 Battle of Zoji La, by Brig Gen SR Hinds, Military Digest, नई दिल्ली, 1962. History of Jammu and Kashmir Rifles (1820-1956), by Maj K Barhma Singh, Lancer International नई दिल्ली, 1990, ISBN 81-7062-091-0.